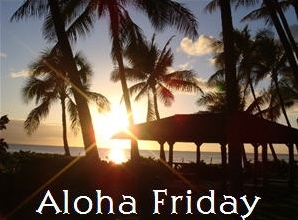 Aloha, it's Friday! It's been a long week, and I'm so happy it's finally Friday. I've been in training this week at work, and I feel totally drained. I'm looking forward to a great weekend. Tonight, I'm slumbering at a friend's house so we can get up bright and early to head to Anna Maria Island. We will be setting up shop to sell our wares at the Thieves Market, (kind of a swap meet of sorts.) I'll be selling jewelry, and she'll be putting feathers and tinsel highlights in hair and selling her awesome tutus, (I'll be wearing the new tutu she made me!) What fun! So, today is Friday the 13th, which makes many people nervous. Do you have any superstitions? And no...Friday 13th is always my most favorite day of the month. I find it to be lucky....or maybe its just a desire to get lucky...either way ITS FRIDAY! Geez- I forgot all about Friday the 13th. Oh well. I'm not really superstitious but my husband is. He won't surf on Friday the 13th.